The new original series Suits delves into the fast-paced, high-stakes world of a top Manhattan corporate law firm where hotshot attorney Harvey Specter (Gabriel Macht) makes a risky move by hiring the brilliant but unmotivated, Mike Ross (Patrick J. Adams), as his new associate. The only problem is he doesn't have an actual law degree. With his encyclopedic knowledge and uncanny knack of remembering things, Mike proves to be a legal pro..
Own Suits Season 1 to 7 Blu-Ray from Deff, DVD, Blu-Ray & 4K Video Specialists - Free UK Delivery..
Power is shifting and lines are crossed in the gripping third season of Suits. Following the firm’s merger with a prestigious British business, loyalties are tested between high-powered counsel Harvey Specter (Gabriel Macht), legal prodigy Mike Ross (Patrick J. Adams) and their boss, managing partner Jessica Pearson (Gina Torres, TV's "Gossip Girl"). With Rick Hoffman (TV's "Samantha Who? "), Meghan Markle (Horrible Bosses), and Sarah Ra.. The complete fifth season of the US legal drama that follows the cases of a pair of New York lawyers, only one of whom attended law school. In this season, Mike (Patrick J. Adams) and Rachel (Meghan Markle)'s engagement is overshadowed by the departure of Donna (Sarah Rafferty) from the firm as well as the insistence of Rachel's dad Robert (Wendell Pierce) that the pair sign a prenup. Harvey (Gabriel Macht) is furious with Donna's decis.. Celebrate the first three seasons of the acclaimed series 'Suits', the show that delves deep inside the fast-paced high-stakes, cutthroat world of Manhattan corporate law - where nothing especially the truth, is ever black and white. 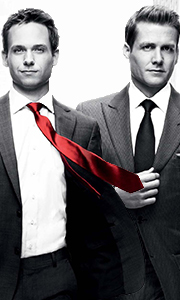 When high-flying litigation counsel Harvey Specter (Gabriel Macht) risks his forminable reputation on hiring mercurial rookie Mike Ross (Patrick J. Adams) an irrepressible legal duo is quickly born. There's..
Own Suits Season 1 to 7 DVD from Deff, DVD, Blu-Ray & 4K Video Specialists - Free UK Delivery..
Hotshot attorney Harvey Specter (Gabriel Macht, Love and Other Drugs) and legal prodigy Mike Ross (Patrick J. Adams, Luck) - who actually doesn't have a law degree - return as the dynamic duo in season two of the hit series Suits. Harvey and Mike continue to hide their secret as they deal with the ominous return of founding partner Daniel Hardman (David Costabile, Breaking Bad), juggle demanding caseloads, and tackle dramatic developmen..
Power is shifting and lines are crossed in the gripping third season of Suits. Following the firm’s merger with a prestigious British business, loyalties are tested between high-powered counsel Harvey Specter (Gabriel Macht, Love and Other Drugs), legal prodigy Mike Ross (Patrick J. Adams, TV's "Lost") and their boss, managing partner Jessica Pearson (Gina Torres, TV's "Gossip Girl"). With Rick Hoffman (TV's "Samantha Who? "), Meghan Mar.. The complete fourth season of the US legal drama that follows the cases of a pair of New York lawyers, only one of whom attended law school. In this season, Mike (Patrick J. Adams) and Harvey (Gabriel Macht) find themselves on opposite sides of a hostile takeover and a figure from Rachel (Meghan Markle)'s past drives a wedge between her and Mike. The episodes are: 'One-Two-Three Go...', 'Breakfast, Lunch and Dinner', 'Two in the Knees',.. In the high-stakes legal world, contentment doesn’t last long. Though Mike (Patrick J. Adams, TV's Lost) has officially left Pearson Specter in favour of a cutthroat investment firm, temporarily placating the pressure of covering his elaborate lie, all is not well. Harvey (Gabriel Macht, Love and Other Drugs) and Mike quickly find themselves on opposite sides of an intense takeover battle. And, with the SEC’s fervent advances on Pearson.. Boundaries are crossed and alliances tested in the riveting fifth season of Suits. Harvey (Gabriel Macht, Love & Other Drugs) wrestles with complicated feelings when Donna (Sarah Rafferty, Brothers and Sisters) leaves him to work for Louis (Rick Hoffman, Samantha Who?). Louis gets his own share of betrayal when his successful sister wants legal representation by the firm... just not by him. Mike (Patrick J. Adams, Orphan Black) finds hi..
Own Suits Season 6 Blu-Ray from Deff, DVD, Blu-Ray & 4K Video Specialists - Free UK Delivery..
Own Suits Season 6 DVD from Deff, DVD, Blu-Ray & 4K Video Specialists - Free UK Delivery..
Own Suits Season 7 Blu-Ray from Deff, DVD, Blu-Ray & 4K Video Specialists - Free UK Delivery..
Own Suits Season 7 DVD from Deff, DVD, Blu-Ray & 4K Video Specialists - Free UK Delivery..
All 76 episodes from the first five seasons of the US legal drama that follows the cases of New York lawyers Harvey Specter (Gabriel Macht), a senior partner at one of New York's top law firms and Mike Ross (Patrick J. Adams), a gifted college-dropout who Harvey hires despite never attending law school. Season 1 episodes are: 'Pilot', 'Errors and Omissions', 'Inside Track', 'Dirty Little Secrets', 'Bail Out', 'Tricks of the Trade', 'Pla..